Content for this article was taken from the new book Love Like Jesus: How Jesus Loved People (and how you can love like Jesus). For more articles included in the book go to Love Like Jesus Book. Love Like Jesus is due to be published in 2018. The Holy Spirit Better Than a Burger? At church the other night our pastor directed anyone interested in receiving prayer for the outpouring of the Holy Spirit to go to the prayer room after the service. I recently wrote a guest post about the importance of the inspiration of God’s Holy Spirit for Not Ashamed of the Gospel and this prompted someone to ask, How do I know if I have His Holy Spirit? So in obedience to Christ, they stayed in Jerusalem where they all joined together constantly in prayer. 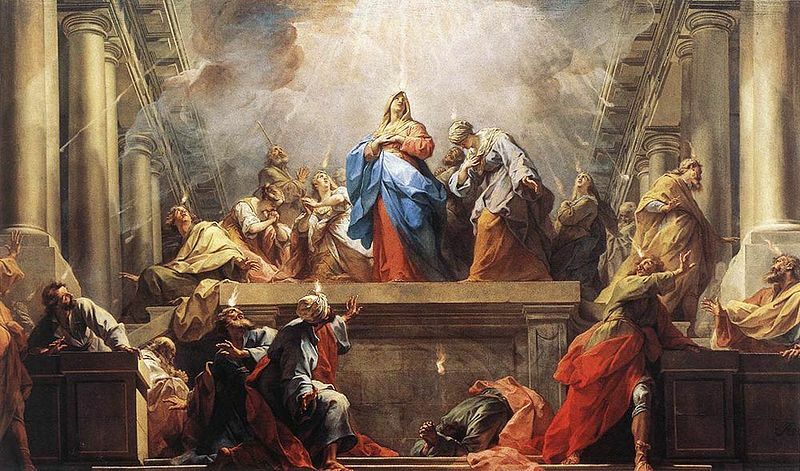 (Acts 1:14) A while later, at a time when many Jews were gathered in Jerusalem for the Feast of Weeks, 120 disciples who were gathered together in one place experienced this outpouring of God’s Holy Spirit. They saw fire that came to rest on each one of them. Tremendous fruit was born that day, as 3,000 of the Jews gathered there were saved. So here’s the thing about the baptism with the Holy Spirit. In Acts, each disciple has this fire resting on top of them, so each one sees the fire on his fellow disciples, but can’t see his or her own! (If you look closely, you’ll see this depicted in Restout’s Pentacost painting shown at the top of this post) It’s similar to when Samson’s hair was finally cut, and the Philistines attacked him. Judges 16:20 says he did not know that the Lord had left him. (Judges 16:20) Samson couldn’t distinguish between when God’s Spirit inspired strength was with him, and when it wasn’t. It’s similar to when Moses came down from spending 40 days with God and his face was glowing: Moses wist not that the skin of his face shone. (Exodus 34:29-35 KJV) Moses had the residual effects of spending time in God’s presence manifested by a glowing face, but he didn’t even realize it. That’s how it is with the Holy Spirit. On rare occasions people experience a sign from heaven, or the blowing of a wind, or a burning sensation as from fire, or waves of liquid love. But more often than not, you can’t tell if you have inspiration from God’s Holy Spirit. The only consistent indicator is the bearing of fruit for God’s kingdom, like the 3,000 saved in Jerusalem. The only problem with that is you may plant seed under the inspiration of God’s Spirit, but you may or may not be around when the season of fruit bearing arrives. But take heart, there’s a solution. Did you notice the disciples received God’s Holy Spirit after praying constantly? (Acts 1:14) And also notice they received the Holy Spirit after spending three years with Jesus, three years living with Him, day in and day out, three years of intimacy with Him. So there’s the answer. There’s no immediate consistent indicator to let you know God has poured out His Holy Spirit upon you. We usually can’t see any readily discernible manifestation of His Holy Spirit when He’s upon us. But we can know, for sure, we have Him, or will have Him, because Jesus said it, that we can receive God’s Holy Spirit as long as we abide in Jesus, and, as long as we pray constantly, persistently, continually, incessantly for God to pour out His Holy Spirit upon us. There’ll be no bold font letters spelling “God” in the from field in your email box, with the words, “Holy Spirit Poured Out Upon You” in the subject line. But because Jesus says your heavenly Father will give the Holy Spirit to those who ask Him! If you ask as the disciples asked, and if you spend time with Christ as the disciples did, you can know, you’ll receive God’s Holy Spirit. This entry was posted in Bible Study, How Jesus Loved People - How You Can Too, Seeker and tagged anointing, baptise Holy Spirit, Having the Holy Spirit upon you, Holy Spirit, How do I know if I have the Holy Spirit, how do you know if the Holy Spirit has left you, how do you know if you have the Holy Spirit, Jesus, signs of the Holy Spirit in you by Kurt Bennett. Bookmark the permalink. Walt, I’m guessing that you’ve been persistently praying for God’s Holy Spirit to be poured out upon you. If that’s the case, may I make a suggestion? While you’re waiting for His Holy Spirit, don’t focus on the presence of His Holy Spirit. Instead focus on (and enjoy) the presence of Jesus in your life. It’s good that you desire the Holy Spirit to be poured out upon you, but what will really fulfill you, what will really satisfy your heart and soul, is the intimate presence of Jesus. Thanks for your question Walter! I would say that we know we have the Holy Spirit in the same way we know we’re saved. Jesus said if we believe on him we’re saved. So even though we may not feel any difference after we receive him, we can be sure Jesus’ words are true. Because we know Jesus’ words are true, we can know that if we believe on Jesus we’re saved. In the same way, Jesus said if we ask for the Holy Spirit then God will give us the Holy Spirit. So if we’re asking in fervent prayer regularly, then because I know Jesus’ words are true, I can know I will receive the Holy Spirit. Even though I may not feel any different. Even though I may not notice any difference. That sums it up. Of course there’s more detail in the blog post itself and even more in the books listed under the reference section. I hope this helps Walter. And I hope and pray our Father will pour out His Holy Spirit upon you in abundant measure! I’m sorry to hear that Walter. How long have you been praying this way? Does one have to speak in other toungs to know they have the holy spirit. Good question Michael. Although some say that’s true, I’m personally not convinced that’s found in scripture. Reblogged this on My Left Brain. I GUESS THE LIVING BREAD ISN’T AS POPULAR—MANY CALLED BUT FEW ARE CHOSEN (BY CHOOSING TO NOT PARTAKE THEMSELVES)! Accidentally came into this blog or website ….! Normally I don’t and never put post or comments …. I am always a quiet readers ….! But I am reading interesting conversation and messages from above posting … I am a Chinese from Singapore … On the other side of the globe … But still sees and read your interesting exchanges of conversation here … Interesting ….! Keep the Spirit up in God … God bless you all … ! Stay and remain in him and never up …. Just like me … About 30 yrs now in Jesus … ! Praise God …! And till then … Bye …. ! Date : 10 Jan 2014, 1625 hrs ( Singapore date and time ). That’s interesting Simon, especially since one of the important inspirations for this post came from a man who spent his life sharing Jesus in China, Hudson Taylor. His life was changed when he started abiding in Jesus, moment by moment. It sounds like you’re doing the same. I think I could learn from you. Email me anytime at kurt@kurtbennettbooks.com! My son suffers from depression and anxiety. He has shown signs of suiside recently. I wanted to pray for him. I thought if I am not saved, that me praying for him, would do no good. So I first prayed for my salvation. When I prayed for my salvation, I was trembling. Then I prayed for him. Ive been reading my Bible. I even prayed out load with my wife (something I’ve never done). Now when I was younger I had ask God to come into my life. I was also baptized. However I have been in and out of church, only staying for short times. I haven’t ever really studied the bible, but always believed in Jesus. I aways feel guilty for not going to church. I love to hear about the bible, but don’t like to read. When im in church I always brake down and cry. When I see someone do good for others I also cry. I question weather or not I am saved. Also if I have the holy Spirit. What should I do to be sure? Samuel, I would love to pray for you and have a conversation with you. Why don’t you email me–my email address is kurt@kurtbennettbooks.com . Exactly Jeff! I just replied to a comment from Evelyn and basically said the same thing. Thank you for your comment! In galatians 5 :22-23 we are told the fruits of the spirit, my question is this , how do you know whether the fruits listed in this verse like patience, kindness… in you are from the Holyspirit and not just the personality God made you with and also if they are not just a result of growing up and maturing and gaining different experiences in your life? Great question Evelyn. The only way I know of to be sure you’ll receive the Holy Spirit is to pray for God’s Holy Spirit in the way Jesus prescribes for us to pray for God’s Holy Spirit: persistently and continually, like the woman before the unrighteous judge. If we do that, we’ll receive the Holy Spirit. (Or Jesus was a liar, which of course he’s not.) As far as determining when we receive the Holy Spirit, or discerning whether or not the fruits listed are inherent in our personality, I think there are times when it’s just obvious, but, I believe that most of the time we’re under the inspiration of the Holy Spirit we don’t even realize it. I also think whether the fruits listed are from your personality, or from His Holy Spirit, either way, it’s a gift from God. Excellent question. Thanks for your comment and I pray our Father will pour His Holy Spirit out upon you and your family in abundant measure. Do you think God would send the Holy Spirit in the midst of addiction, if I were crying out to him? My experience pulled me close to God but was difficult to accept/trust beings I was under the influence. But it was his gentle, love, and joy. I have no doubt Jesus was with me, but could I have missed out as wasn’t sober, and awaiting his spirit? Hope this makes sense. That’s a great question Brandee. I’m not an expert in addiction. But I do know Jesus said if we pray as the woman petitioned the unrighteous judge (Luke 18), and as the man asking for loaves (Luke 11:5-10), and if we ask in Jesus name (John 14:13), “your Father in heaven (will) give the Holy Spirit.” (Luke 11:5-13) So either that is true, or God is a liar, and I’m going with God. So pray for the Holy Spirit, and pray for deliverance from your addiction. Pray every day. Pray three times a day. Pray as the woman before the unrighteous judge. Jesus will come through in the end. Acts 10:46 is the only biblical test. Kurt, I was going to be lazy and click a “like” button, but I couldn’t find one. I enjoyed your post and like your emphasis on the more gentle fruits of the Spirit. Glad you enjoyed it Linda. Thanks for stopping by. What about speaking in tongues as a visible sign, Kurt? That happened quite a lot in the book of Acts, and seemed to be used as evidence of the Holy Spirit in some places. Eg Acts 10:46 this was evidence that the Gentiles had received the Holy Spirit. In Acts 19:6 they spoke in tongues and prophesied when the Holy Spirit came on them, implying they didn’t do so before. So the visible sign of the Baptism is speaking in tongues and sometimes prophesying. That’s a great point! There’s also the fruit of the Spirit listed as evidence in Galatians 5: love, joy, peace, forbearance, kindness, goodness, faithfulness, gentleness, and self control. But I think for many of us, quite often we can’t see the Holy Spirit, or feel the Holy Spirit when He’s upon us. It’s during those times we have to trust in Jesus’ words from Luke 11. But what I realized over time is that as the years go by and you ask for God to pour out the Holy Spirit upon you and to give you a re-fill, I experience that emotional high less and less frequently. It’s more now about accepting it by faith and believing that God will deliver on His promise that He gives us in His Word. Well said Pete. My experience has been the same. In a culture where people are increasingly growing accustomed to instant gratification, it’s against the flow to do so, but you’re right. In the end it’s about faith in the words of Jesus and trusting Him to come through. God’s richest blessings on you and thanks for all you do for His kingdom! Me too! I love working with you this way. In trying to be used by God to bless people, I’m always the one being blessed! Your friendship is a big part of that. Someday I’d like to get down to South Bay and visit, in person. Very well put. I had a similar experience in a season of my life, but then questioned why it went away….what did I do…thanks for the reassurance! Thanks. And congrats on your “One Lovely Blog” nomination for http://truewarriorsofgod.wordpress.com. O.k so here we go, I following Peter on twitter, which lead me to this blog site, which lead me to @ifightforgod’s blog and needless to say enjoyed the blog sites!! AAAAANNNND I’m following y’all both now @kurt_bennet & @ifightforgod! Because we’re all after God’s own heart! May you all continue to be a blessing! haha I’m glad you found my blog as well as Kurt’s. Thanks for following me! God bless you exceptionally! Wow, that’s quite a scenic route. A Holy Spirit led journey, I hope! Thanks for stopping by Trave’. Is your blog emmissarynchains? I can’t seem to find it. Thanks. Let me know when you get your blog going.